Alfred A. Knopf, 9780307269812, 515pp. In the decades since his execution by the Nazis in 1945, Dietrich Bonhoeffer, the German pastor, theologian, and anti-Hitler conspirator, has become one of the most widely read and inspiring Christian thinkers of our time. Now, drawing on extensive new research, "Strange Glory" offers adefinitive account, by turns majestic and intimate, of this modern icon. The scion of a grand family that rarely went to church, Dietrich decided as a thirteen-year-old to become a theologian. By twenty-one, the rather snobbish and awkward young man had already written a dissertation hailed by Karl Barth as a theological miracle. But it was only the first step in a lifelong effort to recover an authentic and orthodox Christianity from the dilutions of liberal Protestantism and the modern idolatries of blood and nation which forces had left the German church completely helpless against the onslaught of Nazism. From the start, Bonhoeffer insisted that the essence of Christianity was not its abstract precepts but the concrete reality of the shared life in Christ. In 1930, his search for that true fellowship led Bonhoeffer to America for ten fateful months in the company of social reformers, Harlem churchmen, and public intellectuals. Energized by the lived faith he had seen, he would now begin to make what he later saw as his definitive turn from the phraseological to the real. He went home with renewed vocation and took up ministry among Berlin's downtrodden while trying to find his place in the hoary academic establishment increasingly captive to nationalist fervor. With the rise of Hitler, however, Bonhoeffer's journey took yet another turn. The German church was Nazified, along with every other state-sponsored institution. But it was the Nuremberg laws that set Bonhoeffer's earthly life on an ineluctable path toward destruction. His denunciation of the race statutes as heresy and his insistence on the church's moral obligation to defend all victims of state violence, regardless of race or religion, alienated him from what would become the Reich church and even some fellow resistors. Soon the twenty-seven-year-old pastor was one of the most conspicuous dissidents in Germany. He would carry on subverting the regime and bearing Christian witness, whether in the pastorate he assumed in London, the Pomeranian monastery he established to train dissenting ministers, or in the worldwide ecumenical movement. Increasingly, though, Bonhoeffer would find himself a voice crying in the wilderness, until, finally, he understood that true moral responsibility obliged him to commit treason, for which he would pay with his life. Charles Marsh brings Bonhoeffer to life in his full complexity for the first time. With a keen understanding of the multifaceted writings, often misunderstood, as well as the imperfect man behind the saintly image, here is a nuanced, exhilarating, and often heartrending portrait that lays bare Bonhoeffer's flaws and inner torment, as well as the friendships and the faith that sustained and finally redeemed him. "Strange Glory"is a momentous achievement. Charles Marsh is a professor of religious studies at the University of Virginia and director of the Project on Lived Theology. He is the author of seven previous books, including "God's Long Summer: Stories of Faith and Civil Rights," which won the 1998 Grawemeyer Award in Religion. Of Marsh s earlier volumes "Reclaiming Bonhoeffer, " the late Eberhand Bethge, Bonhoeffer s closest friend and first biographer, wrote: This book is a theological sensation an exciting event. 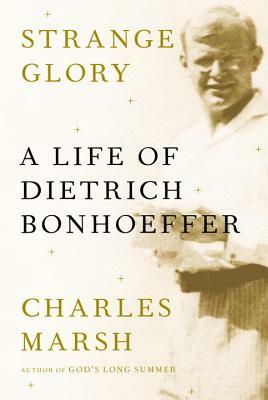 Nobody who attempts to define Bonhoeffer s legacy today will able to ignore Marsh s book. Marsh was a recipient of a Guggenheim fellowship in 2009 and the 2010 Ellen Maria Gorrissen Berlin Prize fellowship at the American Academy in Berlin. He lives in Charlottesville, Virginia." —James Carroll, Author of Christ Actually: The Son of God for the Secular Age.